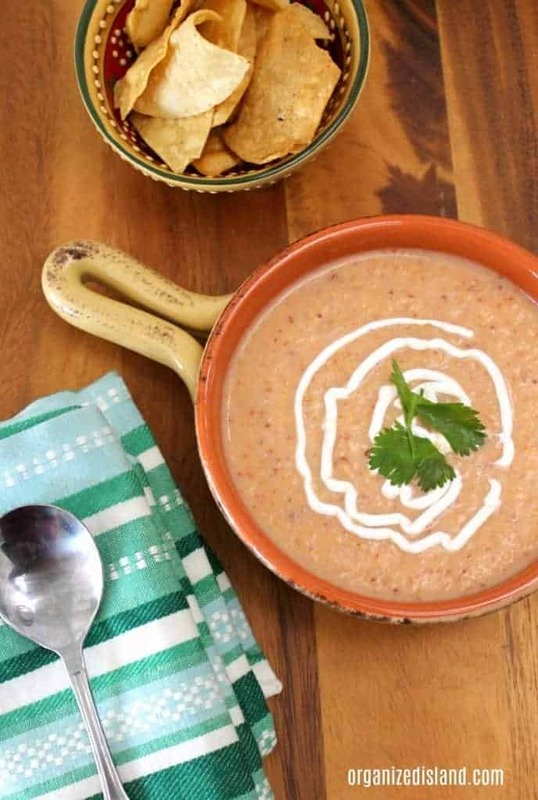 This Potato Chipotle Soup Recipe with tortillas is a nice hearty soup for chilly days! This recipe sort of came about quite by accident. I wanted to make a potato soup a little spicier so I thought I would add some Chipotle peppers to it. I added some cream and spices and it actually came out very good. It’s a nice, slightly spicy soup that brings extra warmth to a cold day. It goes great with these Green Chili Quesadillas or tortillas and butter. It also can be made the day before which I think is nice because the flavors get a chance to blend. Another great thing about this recipe is that it is a very low cost to make. With the main ingredients being potatoes and chipotle peppers, you can make a pot of soup for just a few dollars. In a large pot, add 5 cups chicken broth chopped potatoes, onion, celery and tortilla Cook over medium heat until water starts to boil. Cover and cook on low heat about 25 minutes, or until potatoes are thoroughly cooked. Add milk, chili in adobo, salt, garlic salt, and pepper. Use an immersion blender to blend well. Simmer for 10 -15 minutes and serve. This is when I add hot sauce/chili powder, according to taste. 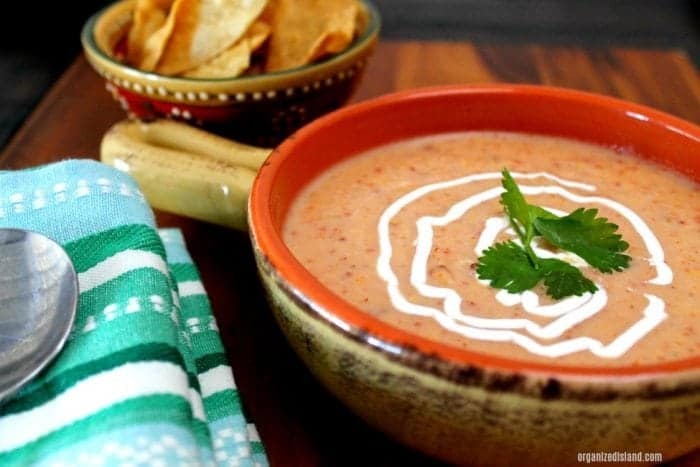 This Chipotle Red Pepper Soup recipe is a nice one for warming up on a cold day. 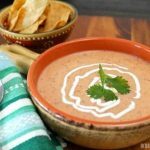 You will note that there are tortillas in the soup as well that dissolve and work as a great thickener for soups. Topping it off with some sour cream and cilantro is optional, but makes it prettier! We love to eat this while watching some of our favorite shows. 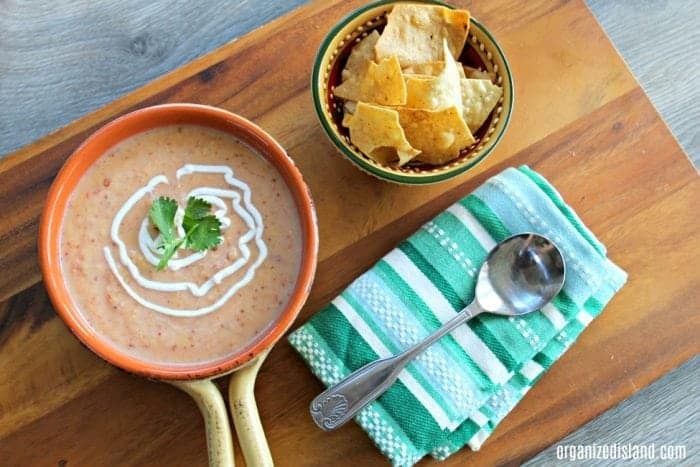 These cute soup bowls with handles make it easy to enjoy! If you do not have broth on hand, you can make this recipe using a chicken bouillon or bouillon granules). I like to use a ratio of 1 cube to two cups of water to keep the sodium level a little lower. Make this the night before and it will keep well in the refrigerator. You can also use vegetable broth for this recipe. I hope you enjoyed my Potato Soup with Chipotle Chili. We strive to help you make the most of your time in the kitchen. What is your favorite hearty soup? 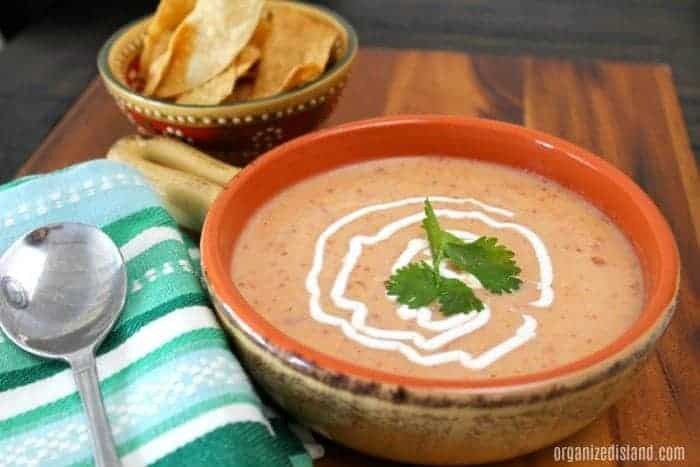 For more great soup recipes, check out our delicious Mexicorn Chowder a wonderful, hearty soup with potatoes and mexicorn. You may also like our Chicken Soup with Spaghetti Noodles, a perfect soup for anytime, and especially if you have family members that need a little extra comfort. You’re my hero with this one. I love potato ANYTHING and potato soup is a weakness. And, no onions or cilantro! Ha! I remembered cilantro but did not know about the onions. You would love this Tamara! Raquel, this soup looks so yummy! I love the combination of potato and chipotle. I don’t think I’ve ever encountered that before – which makes me want to try this! Thanks so much! It really is a nice combination!